Nick and I went to high school together, Our grade was small, so we were friends our first year. We stayed in touch after we graduated and before we started officially dating we had 8 years of history behind us! We never officially dated before because Nick, I believe, always had a plan for us to be together when the time was right. The universe definitely had a plan for us as we are truly one another's soulmates. How did Nick ask you to marry him? In 2012, we had been together one year, and we went to a friend's wedding in Kelowna, B.C when we were there Nick took me to a vineyard, Burrowing Owl - and it was the most drop dread gorgeous views & experience. We both felt the energy: it was our place and I teased Nick that when he would propose this would be the place. When we decided to revisit the place we had had such a great time at : Kelowna, B.C. I had an inkling that we would get engaged. We had been together 5 years at that point, and it felt right. Nick proposed at the vineyard, and it was magic. 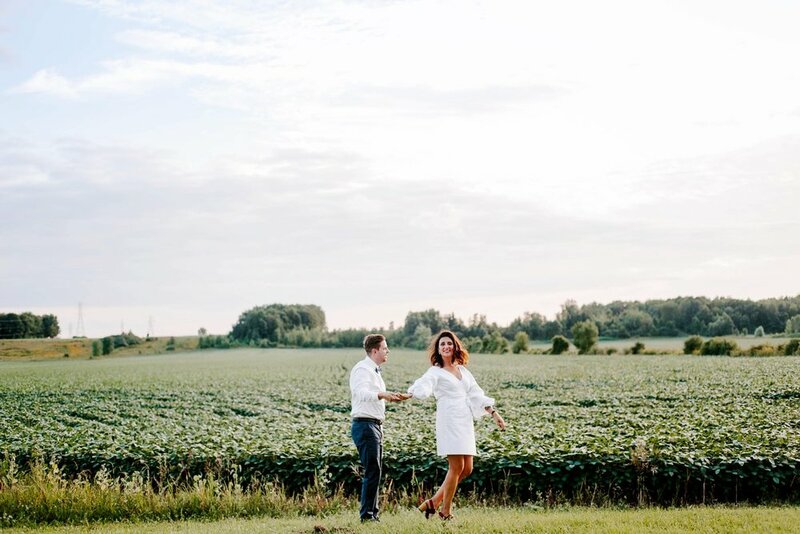 It didn't go at all as planned, but it was so perfectly our style it all made magical sense! It was the best moment, before the wedding day, of our lives. I always say, everyone deserves to feel the love I felt being proposed to. It's just an incredible feeling to be proposed to by your biggest love and best friend! Why did you choose lemons as your theme? For a few reasons! Nick named a drink after us many years ago and it became our signature drink whenever we hosted our annual countryside summer bash on Victoria Day weekend. Our friends and family know all our events will feature the drink: Lemon Squeezie (all Lemons squeezed by Nick! ): A little tart with lots of love! Lemons are our favourite fruit and garnish. Wherever we go, lemonade is inevitably involved and it stands metaphorically for our mantra to always find the joy even in the most trying scenarios: "When life gives you Lemons" as they say! We were also planning our honeymoon in Italy which we had always dreamt about visiting. 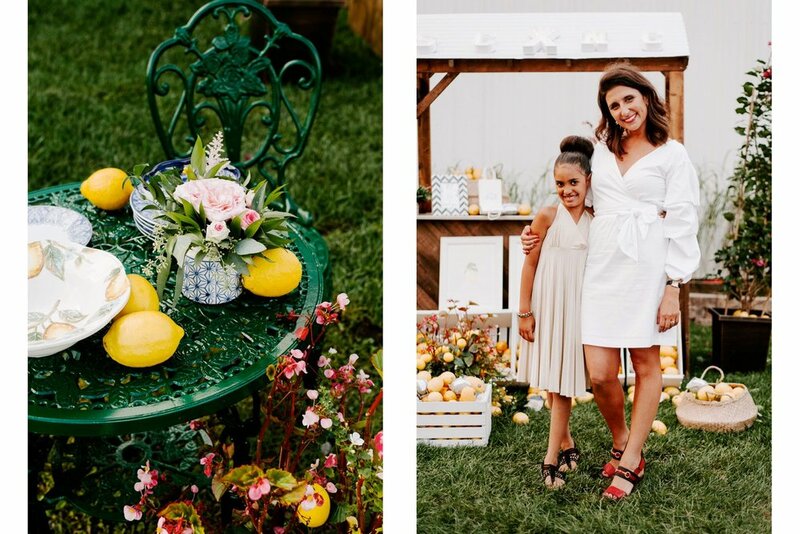 Lemons, associated with our Love, Italy and the heat of the summer just seemed like the perfect theme and colour for our Farm Bash! It was a true hit! The signature drink ran us out of Vodka by 7pm- if you can believe it! What's the first thing that attracted you to the other? Since we were so young, it was definitely looks ahhh!~ Beyond that what keeps our love and spark alive is honestly how much fun we have together. My parents often tease us that we are 100 years old already as a couple. It feels so true. We have this friendship and love and respect for one another that sparked our initial chemistry and is our secret to happiness as a couple. Stephanie what do you love about Nick? Nick is the funniest guy I know. His sense of humour is a key ingredient in our equation. Even if things feel heavy or tense, Nick finds a way to lighten the mood. He loves to sing actually, and will often re-lyric a jingle to our story. Often he's chirping me in the lyrics which always makes me laugh! What's better than a guy who can jingle a tune and make you laugh?! Nick what do you love about Stephanie? I love how outgoing Stephanie is, and how she's able to liven up a room with her friendliness and positive disposition. 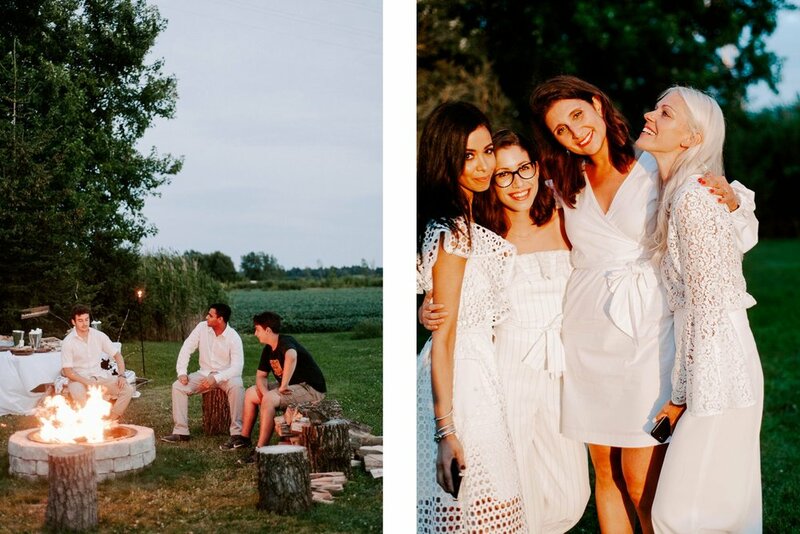 The most challenging thing was the location, We decided to host the party at Nick's Uncle's working farm. This meant we had to rent everything from the bar to the chairs and even a tent in case of rain. We needed every prop, and we had to clean and de-clutter the barn to make it look like an event space versus a barn for the soy crops. This was no easy feat. This whole process, involved lots of manual labour and quite the team. As a family, we came together and everyone pulled so much weight, it was an event put together with lots of love and sweat! But no tears hahah! Thankfully ;) It brought us all closer together and we are so grateful that our family loves us so much to have worked so hard amid their busy crop season and be so organized about hosting this party. The best thing about it was the location and the details. 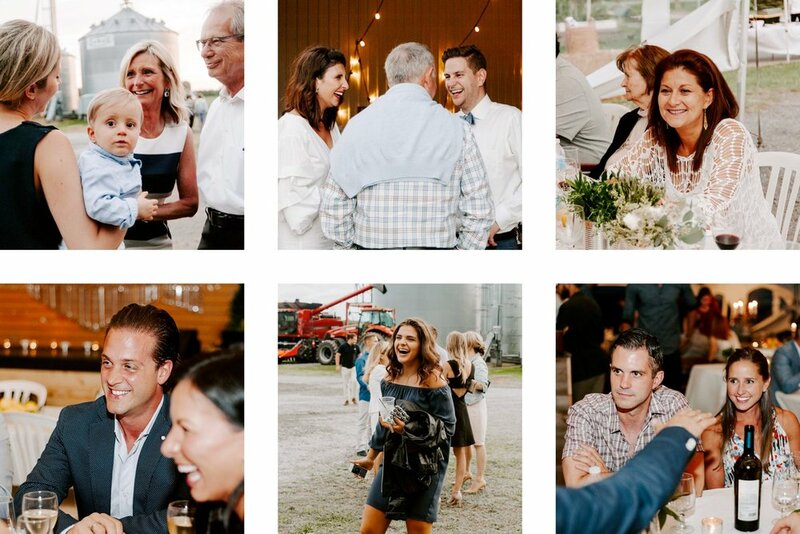 We went all out treating our guests, to the farm party we had always dreamed of hosting. We had a bonfire & s'mores pit, our signature drink - Lemon Squeezie, and our family restaurant, Lucilles outdoor Bar-B-Q'ing the whole feast! Our guests told us they loved the details, the food, and that there was a no fuss vibe to the party. We believe that a good party involves making your guests feel like they matter the most, and this doesn't mean going all out, but doing everything with love.